The older you get the harder it is to lose weight. That’s a fact. Some of us try special foods, special diets, prescriptions, gym memberships and fancy home exercise equipment. We try fad diets. We try cutting certain kinds of foods out of our mealplans. We try just about anything we can think of! Could real weight loss be as simple as eating more apples? Apples are full of nutrients, fiber and moisture. By simply eating an average sized apple before your main meal you might find that you’re fuller and less likely to go for seconds, and opt out of dessert. It seems, that when we eat a meal, that we begin to feel full after about twenty minutes. Fast eaters, those that gobble down or rake in their food, will end up with more calorie consumption. Those that began to fill their tummies with an apple will have less room to fill up on higher caloric foods. That apple was full of fiber too, helping to keep you feeling fuller longer. 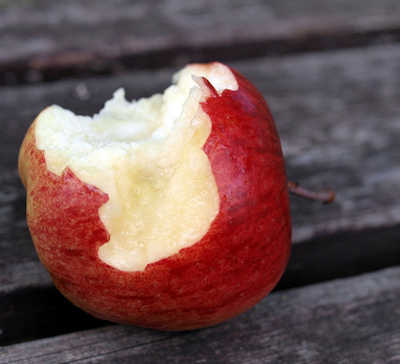 Can’t get your kids or spouse to snack on an apple before dinner? Try cutting one up and serving it to them on a small saucer or bowl. Sometimes, it’s all about presentation… and temptation. As long as you have the apples out…. consider cooking up some Pork Chops with Apples & Rosemary!